Beside the basic skincare or treatment routine which we can do it at home, body care is essential too. By looking at our skin condition or texture on nail, elbows, ankles, knees, heels and toes, they reflect how hygienic and healthy a person is. I knew most of us tend to spend time on skincare, even simply brush through with some body lotion, to whiten and moisture the skin. Yet, are you guys taking good care of our nails and heels too? Can you imagine yourself extending your arms towards someone, with dirty, dull and ugly nails? Definitely a no for me! We should always looks the best from both inside and out, left to right, top to bottom! Scholl has really put an effort in advertising their latest Electronic Nail Care System lately, I meant I saw the ads everywhere! On television, Facebook and even when I was doing my blog walking. All the good reviews on the electronic nail care system. Since I have reviewed on the Scholl Pedicure Electronic File last year, my mom was like "Eh, why don't you get one? It seems like a great tool!" 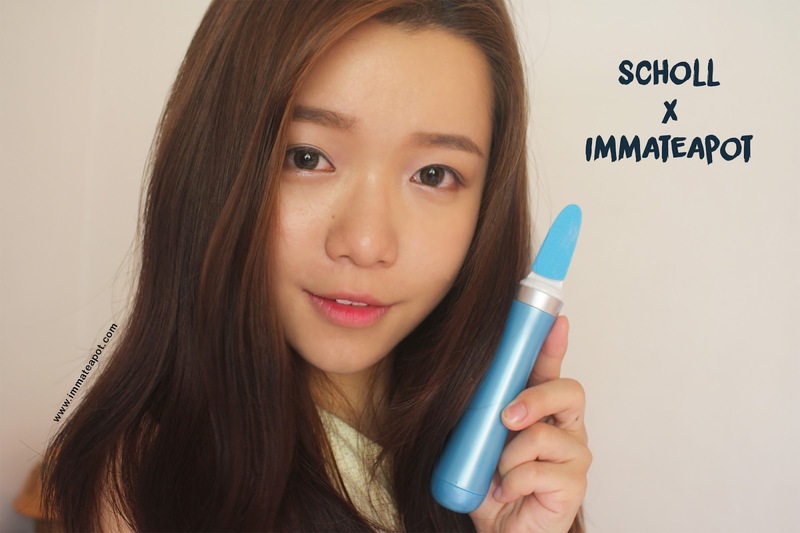 When I was about considering to check them out, Scholl has sweetly delivered them right at my door step OMG! 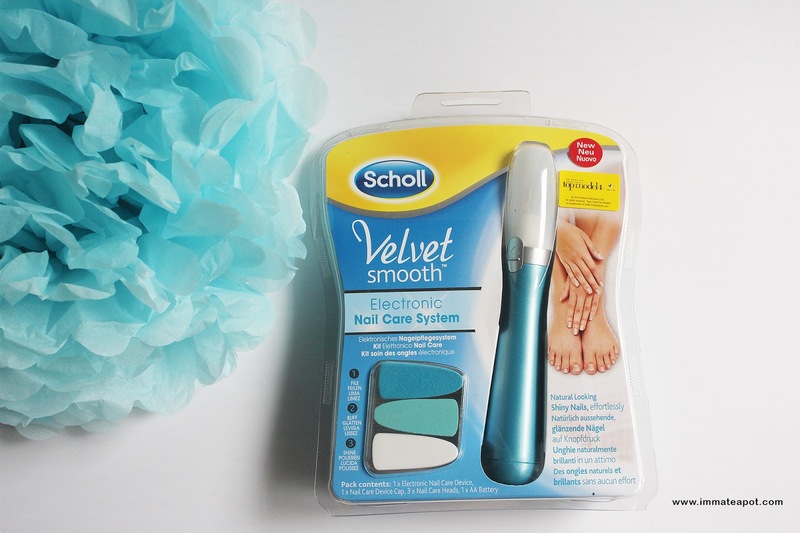 Ding Dong, so the Scholl Velvet Smooth Electronic Nail Care System has finally arrived! I just can't wait to unwrap it. As usual, the packaging was in full blue and yellow color scheme, which was pretty similar to the express pedi electronic foot file. 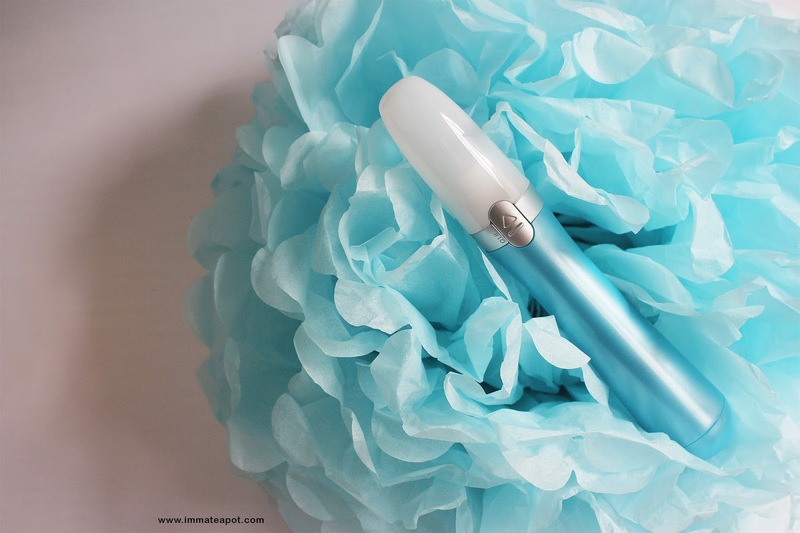 The electronic nail care device comes in a long tube shape, which looks much like a plus size pen. The size and shape of it has bring a lot of convenient to us ladies! We can simple carry it effortlessly in our hand bag or even travel bag. We can now have glossy nails anytime anywhere. 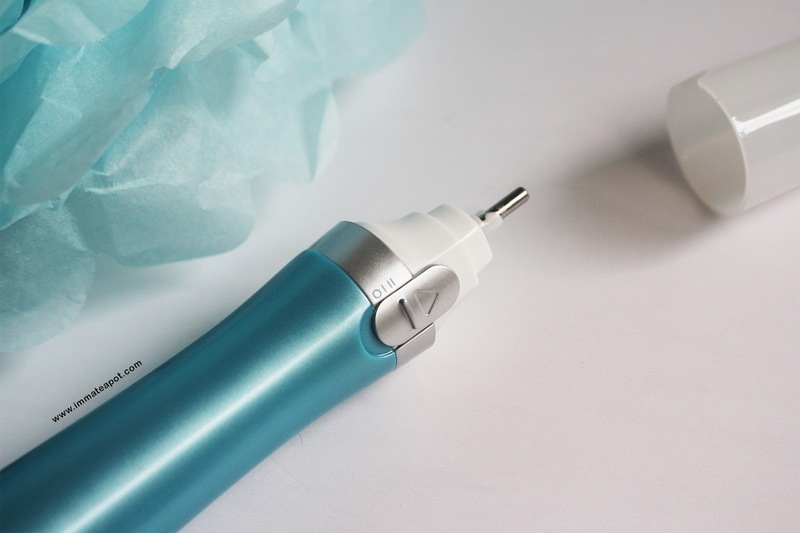 At the top of the Nail Care Device, it contains a thick needle-like oscillating head that can be inputted with 3 interchangeable heads. 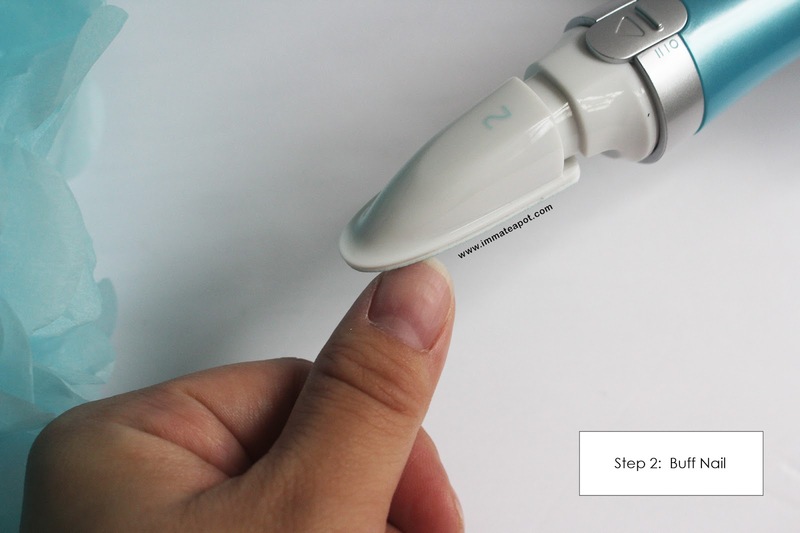 At the handle of the Nail Care Device comes with a switch that indicating on and off, as well as two different speed options. We can manipulate the two different speed for optimal control and desired result, in a much faster or gentle way. O for off, I for slower speed, II for faster speed. At the bottom of the Nail Care Device, it comes with a cap, where the inner part is a space for battery. 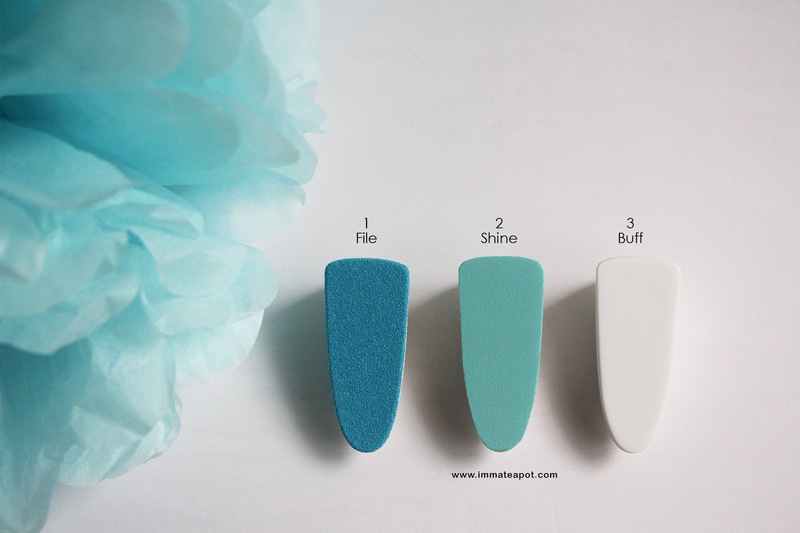 lightest white shade (smooth spongy texture) for shining purpose. The heads are refillable too! This is how the head is inserted on to the oscillating heads, easily and securely. 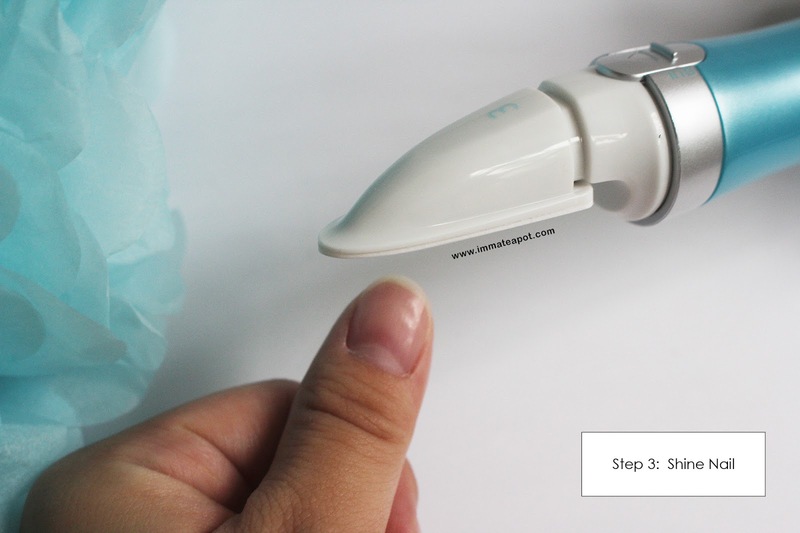 The application of Electronic Nail Care Device is superb easy as it involves only 3 steps in achieving glossy and healthy nails! Step 1: Gently file and shape the nail edges, following the natural edge lines. Step 2: Lightly buff the nail surface to smooth away ridges. 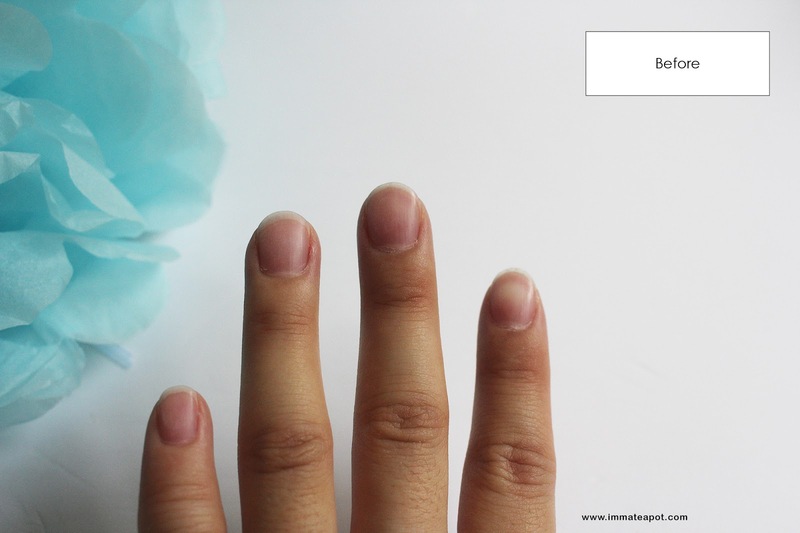 Not to over buff your nail and if you have thinner nails, please consider to use the lowest speed. 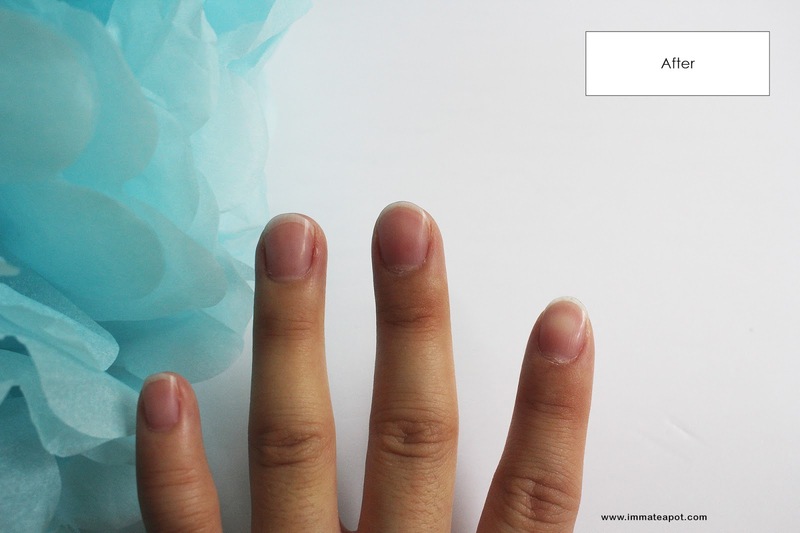 Step 3: Polish your nail surface, from the outer part of the nails moving towards the center part. Step 4: A step to be skipped or not! Apply the Scholl Nail Care Oil to moisture and protects the cuticles of your nails. Scholl Nail Care oil consists of Sunflower seed oil, Apricot kernel oil, Shea Oil, Avocado Oil and more pure natural ingredients, that contains Vitamin E and Omega 3 that helps nourishing the nail. Here are pictures before and after the application of Electronic Nail Care System. Before application, my nails are dull and the texture are rough. After application, my nails look healthier and glowy! I found that with glossy nails, it even brighten up my overall skin tone. 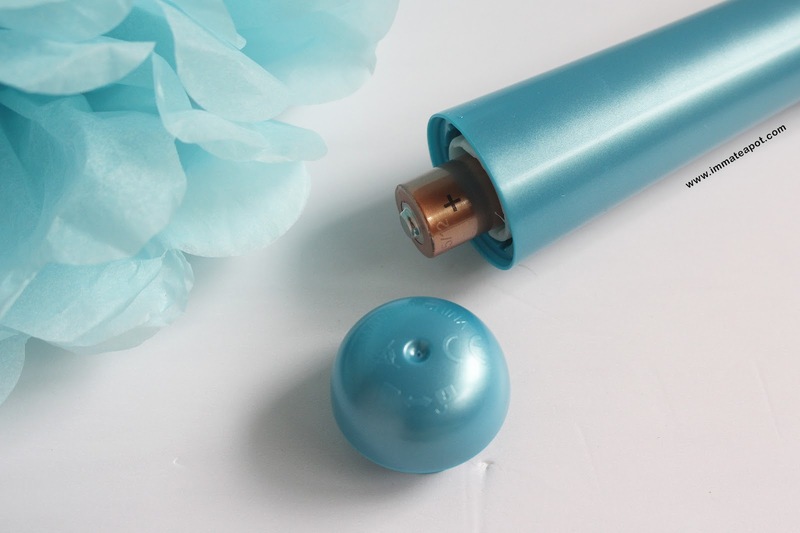 I really love the easy application of the device and the travel friendly size! The overall process took less than 10 minutes! Faster, easier and brighter! I can now owning the healthy shiny looking nails effortlessly with Scholl Electronic Nail Care System. *All the items are available at pharmarcies, Caring, Guardian, Watsons, Giant and Tesco. seem good that we can do on our own at home! 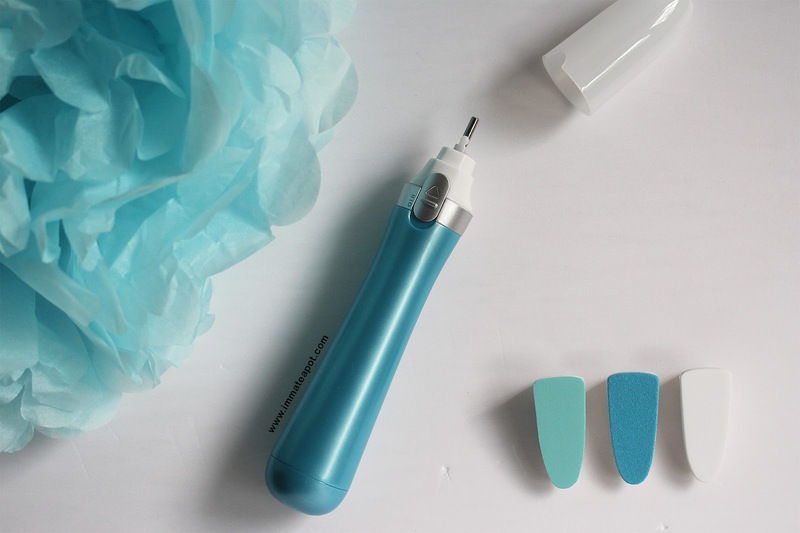 I've always used nail care from Watson, but this nail device seems to have more functions! This look simple! Very easy breasy to use too. looks very nice! seems so convenient!! now i can enjoy good nails even at home. Need to have these for perfect nails! plus the colour is really nice too! 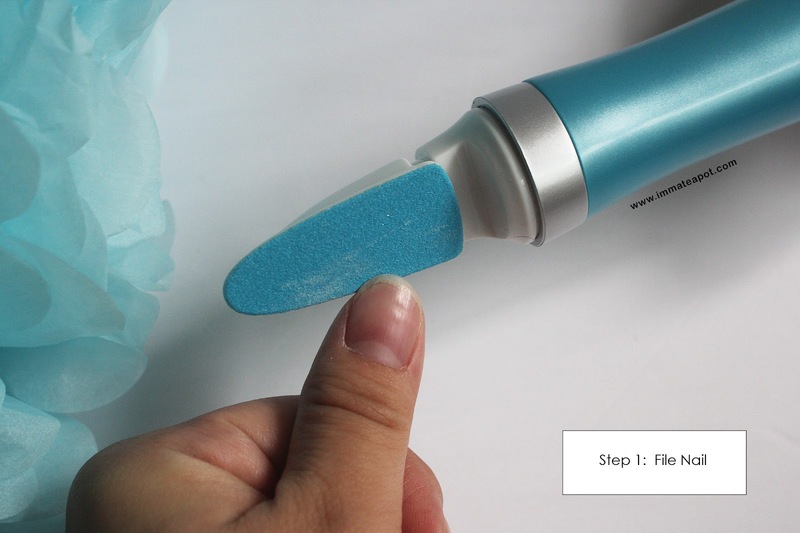 Such a great tool for manicure... I wish I could own one, too! Isn't this just so handy? Haha, I love the convenience of it, we can all have our own manicure now. I'm guilty of neglecting my nails. The photos are really attractive, makes me want to own one! I often neglect my nails. Need nice manicure probably with Scholl. hehehe.. manicure also can express now. great! Love how fuss free this thing is! We can now all do express manicure at home too... Brilliant product! Read alot of good things about this product! Always loved the final step to a manicure haha! Looks super easy to use! I might need one for myself.